Even though we decided to do brunch for our Friendsgiving this year, that didn’t mean we skipped dessert. Far from it! Originally, I had been thinking I’d try to create some kind of cinnamon roll recipe, but then I thought, “You know what’s even better than cinnamon rolls? Sticky buns.” It was a light bulb moment. (Yes, I have my light bulb moments around food ideas sometimes.) And that’s when I decided to work on pecan pie sticky buns for our dessert. 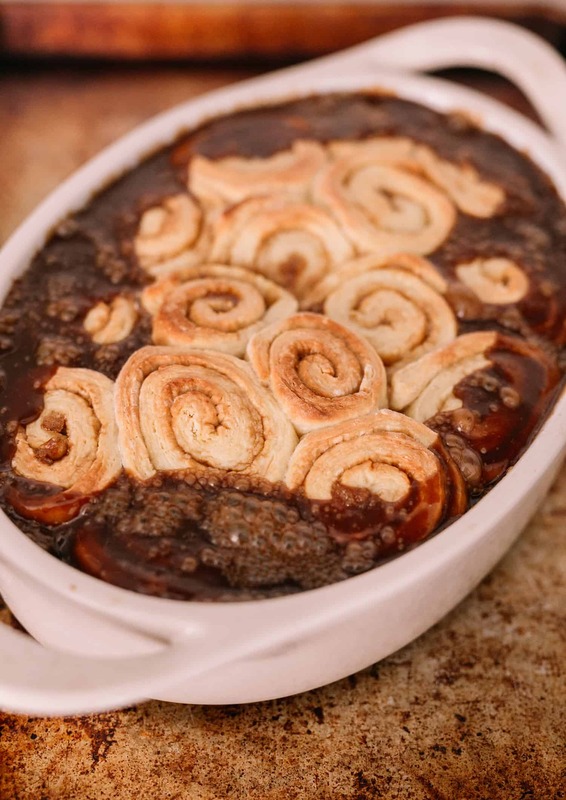 Really, sticky buns are not all that different from cinnamon rolls. The big difference is you bake these with the topping already on the bottom of the pan. Then you flip them out once done. Whereas cinnamon rolls you bake and then add a frosting to them afterward. 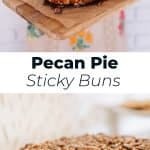 Both are delicious but I must say, these pecan pie sticky buns really are very pretty in addition to being totally delicious. So they get a few bonus points for that. 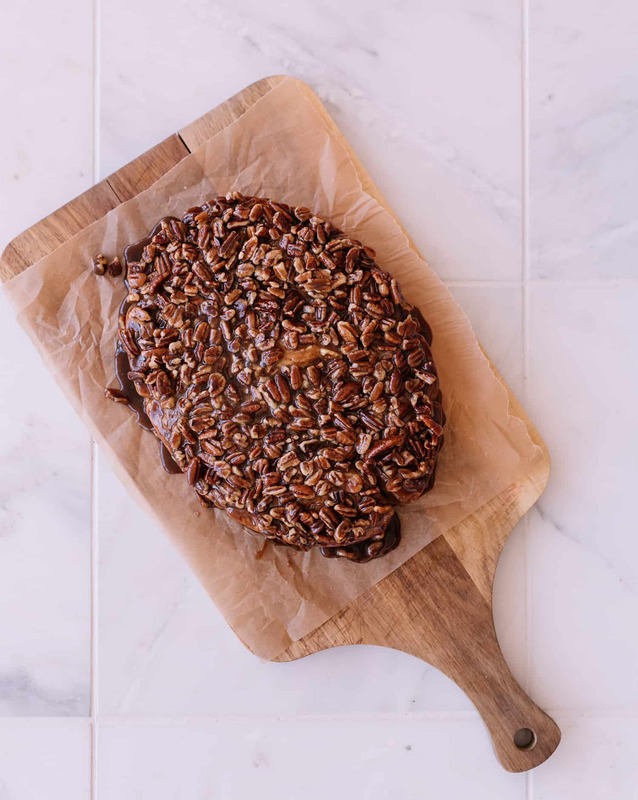 Another great thing about this sticky bun recipe is you can make everything the day before—even assemble the dough in the pan. Then, just bake the next morning and you’ve got sticky buns! 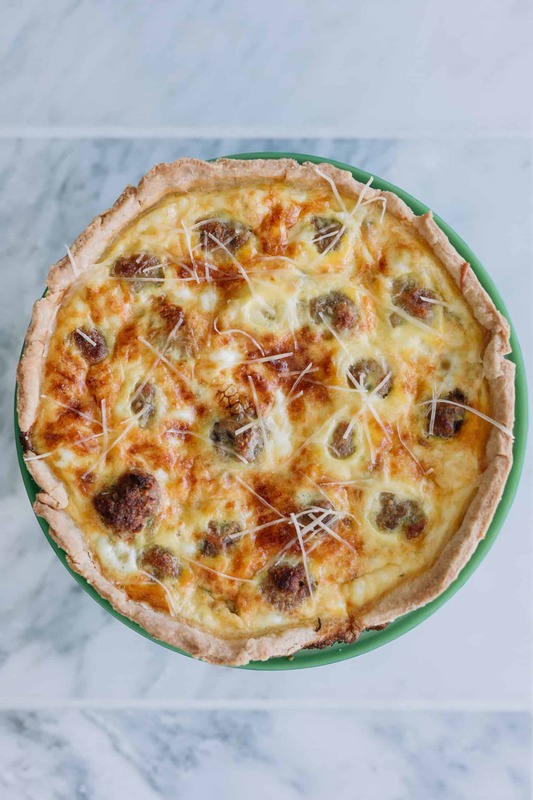 I love make-ahead hacks so you don’t have to wake up super early in the morning to bake something. 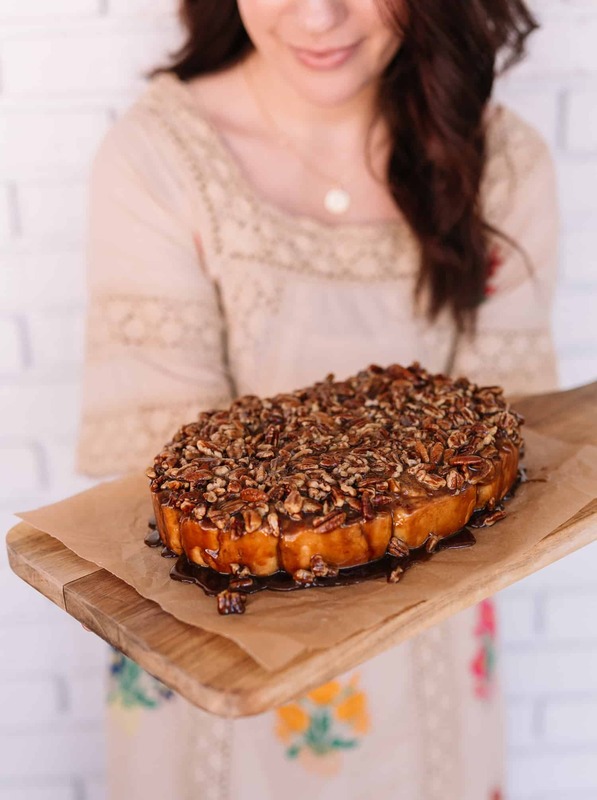 I want all the rewards of waking up early to bake sticky buns, without actually having to wake up early. 🙂 So this is another great recipe for the holidays, including Christmas morning. P.S. I adapted this recipe from these sticky buns I made years ago, which was originally adapted from The Dahlia Bakery Cookbook. In a small pot, melt the butter. Over low heat, stir in the milk and sugar until just warmed and the sugar has dissolved. Remove from heat. Stir in the yeast and allow this to sit and bubble for 8-10 minutes. In a large bowl, stir together the flour and salt. When the yeast is ready, stir it in along with the egg and yolk until a dough begins to form. Turn the dough out onto a floured surface and knead for 4-5 minutes. Place in a lightly oiled bowl, cover and allow to rise for 2 hours. In a pot, melt together the butter, sugar and corn syrup until the sugar has dissolved. Remove from heat and stir in the vanilla and pecans. Pour the batter into a baking dish. Roll out the dough on a lightly floured surface into a large square. For the inside, brush the melted butter and sprinkle in 1/4 cup sugar mixed with 2 teaspoons cinnamon. Roll up and slice into cinnamon rolls. Place the rolls in the prepared pan (with the topping in the bottom). Cover well and refrigerate immediately (overnight). Bake at 350°F for 35-40 minutes until golden brown. Allow to cool for 5-10 minutes. 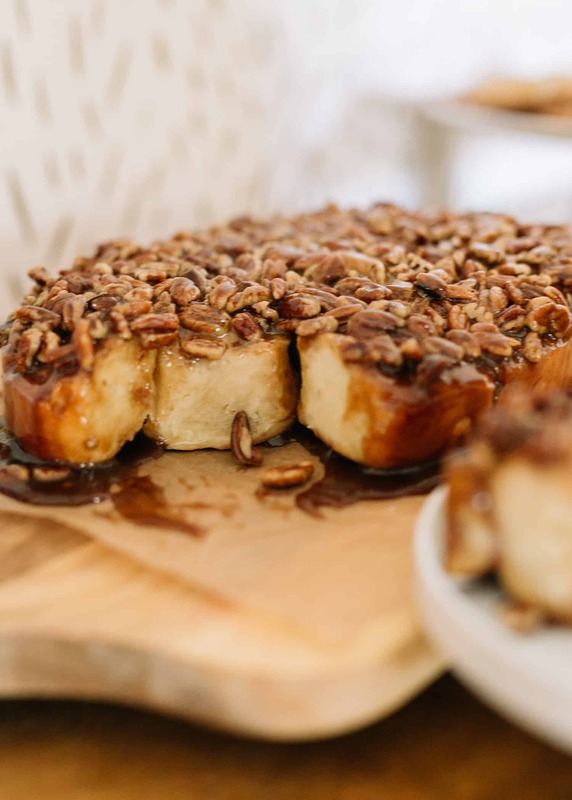 Remove from the oven and CAREFULLY flip the rolls out of the pan, revealing the pecan glaze on top. The best is if you can lay a cutting board or serving dish over the pan and flip it all together. Credits // Author: Emma Chapman. Photos: Amber Ulmer. Photos edited with A Color Story Desktop. These look delicious! 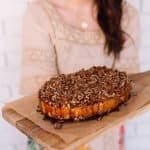 I’m bringing some breakfast goodies as hostess gifts for the Friendsgiving we’re attending this year, and this would be a PERFECT option!! They look so gorgeous, I could really eat one right now! I’m just wondering, how sticky or tacky is this sauce? Is it something that is so sticky it could pull out a filling? Or something a bit more like a medium bodied caramel? It’s more like a thin caramel. YUM! Oh my heavens that looks divine. I’m going to try this. This looks delicious! On the toppin did you mean to write a 1/4 CUP or is it really only a 1/4 tsp of sugar? I’m also confused by the filling ingredients. That doesn’t seem like much for the amount of rolls you’re making. And it’s white sugar instead of brown sugar in the filling? Hi! I want to make these, but don’t do dairy. Do you think margarine will sub well? I haven’t tried it yet so I can’t say with total confidence BUT I do think a non-dairy / vegan butter and using a non-diary milk would still work well in this recipe. Let us know if you try it! Do you bake these covered or uncovered once you pull them from the fridge?